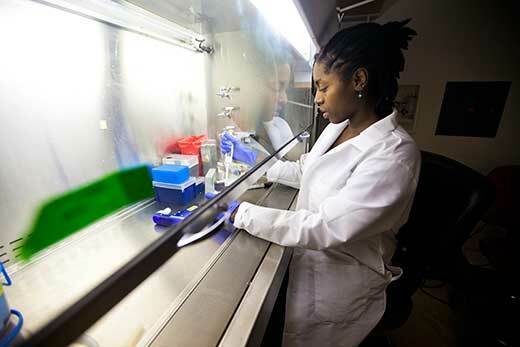 Laney Graduate School's partnership with Xavier University of Louisiana is among the school's initiatives to increase the number of students from underrepresented groups who complete doctoral degrees in biological and biomedical sciences. Pictured is Emory doctoral student Erica Bizzell. Emory Photo/Video. The James T. Laney School of Graduate Studies at Emory is one of 11 higher education institutions that are partnering with Xavier University of Louisiana, which has received a $19.6 million grant from the National Institutes of Health (NIH) as part of the national Building Infrastructure Leading to Diversity (BUILD) Initiative. Xavier will use the grant to expand the already thriving biomedical programs the historically black university offers its students. Laney Graduate School and other partner institutions will have access to Xavier STEM students to participate in summer research programs and ultimately attract these students to their graduate programs. The students, known as BUILD scholars, are motivated undergraduate science students interested in doing research and pursuing a Ph.D. The BUILD partnership will complement programming already taking place in the Laney Graduate School. Just last year, the NIH awarded the Laney Graduate School a $2.5 million grant to implement the Initiative for Maximizing Student Development (IMSD) program. IMSD, directed by Keith Wilkinson and Patricia Marsteller, also seeks to increase the number of undergraduate and graduate students from underrepresented groups who complete doctoral degrees and enter the biological and biomedical sciences research workforce. "Our commitment to enhancing diversity and inclusion at Emory is being implemented through robust, innovative programming that creates pipelines to increase the number of underrepresented students entering and progressing through doctoral programs in the biomedical sciences and STEM fields," says Lisa Tedesco, vice provost for Academic Affairs-Graduate Studies and dean of Laney Graduate School. "Partnership with Xavier University through the BUILD Initiative will undoubtedly benefit—and better—our efforts," she says. Xavier, which already leads the nation in the number of African American graduates who go on to complete Ph.D.s in the life sciences, aims to triple the number of graduates and increase the number of African American life science Ph.D.s by 10 percent, according to Xavier President Norman Francis. "We are proud that NIH has named us one of the institutions that believes it can uniquely contribute to this important goal," he says. Tedesco says that a deeper level of engagement with BUILD scholars during their undergraduate experience "will create opportunities that we hope will not only attract them to our programs at Emory, but ultimately create and nurture a biomedical workforce that is more representative of the unique perspectives and diversity of our nation." In addition to Emory, other BUILD partners include Johns Hopkins University, Louisiana State University and its Health Sciences Center, Tulane University, University of Wisconsin, Meharry Medical College, George Washington University, Penn State University, University of Rochester and University of California San Francisco. The award is part of a $240 million NIH investment to develop new approaches to engage student researchers, including those from underrepresented backgrounds, and prepare them to thrive in the NIH-funded workforce. Xavier and fellow awardees will establish a national consortium to train, mentor and encourage students from underrepresented groups to enter into and stay in research careers. Xavier's award under the BUILD initiative was one of 12 awards totaling some $31 million in fiscal year 2014 announced Oct. 22 by NIH. This year's awards are part of a projected five-year program to support more than 50 awardees and partnering institutions.